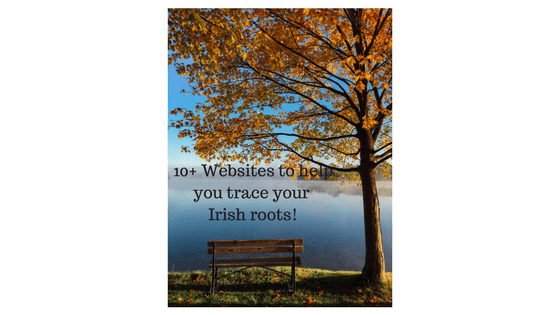 Are you looking to trace your Irish roots, but have no idea where to start? Let me give you a few tips and a few insights I have learned over the last few weeks and months, and 10+ websites I came across in my search. At some point in my life I lived in England and when I returned home to Belgium to attend a family get together, my grandmother started speaking English to me. I was shell shocked as I had never known she spoke English. She then explained that her mother was English, and that there was an Irish connection.. More about that later. It all starts with the information you have such as birthday, baptismal certs, marriage date, death certificates & immigration records. As many of your ancestors lived during the war, and maybe even served in it, there are also army records. I can not emphasis the importance to get as much information as possible from family members as it will significantly improve your chances to get onto the right track. Also a word of warning, their memories may not all be accurate, and one wrong name can send you on a wild goose chase, to then discover the name wasn’t quite right ( I can tell you a few stories). Where your family came from (town land or parish) is also very helpful, unless you have an uncommon surname. Where to keep track of your findings? There are many fee paying websites, but ultimately, much of that information comes from the Mormon church, who are specialized in family research and who sell this information on to the commercial operators such as www.Ancestry.com, www.findmypast.com and www.myheritage.com. Open up a free account on their website https://familysearch.org/ As you start building your tree, you may strike it lucky and find someone has done research on part of your family tree already. In my case, as I am Belgian, there is the Belgian part to research, but for now I will focus on the Northern Irish part( my husband is from Northern Ireland) and also the Republic of Ireland, as I knew all along there was an Irish link via my maternal grandmother on my dad’s side. Regardless where your roots are on the Island of Ireland , your first port of call are the Census document of 1901 and 1911: Census of Ireland, 1901 and 1911, and pre-1901 survivals . I found these to be really interesting, as they contain information about the household , their age, if they could read/write ( many people could not read or write), how long they have been married, their religion, and the number of live children. I also really liked the handwriting:). Start with the 1911 census, and if you found the right person, check if you can find the same person in the 1901 census. You’ll notice that the 1911 records are better indexed /have more options than the 1901 census. I also found that spellings of town lands varies in the documents and do allow for some variation on people’s age, as people didn’t necessarily know exactly when they were born! Here is an example of a census record of 1911 of my mother-in-law grandparents, the Vogan Family. The greatest blow to genealogists and historians was probably the destruction of the Public Record Office of Ireland during the Civil War in June 1922 (sometimes confused with the burning of the Custom House in 1921), and especially the loss of the 1821 Census. Despite that, there are still some records passed 1901, you can search them here: http://censussearchforms.nationalarchives.ie/search/cs/index.jsp and also church records, which are often very valuable too. If you want to see the actual record, you ‘ll need to buy 5 credits, and you’ll see the written entry + the enhanced info. Going back to my www.familysearch.org tree, I added all info and I was given a document hint, which indicates that there may be additional information based on the data I provided. By click on the show details, you can review the record, and accept or reject it. As you can see, there is some variation on the birth year, so having the birth certificate gives you certainty that you are on the right track. I am not getting much further with the Bell part of the family, so I may need to pay a visit to the PRONI in Belfast, which is the Public Records office in Northern Ireland. To continue with my own Irish connection, I was given a lot of detail by a cousin, bringing me from Mechelen(Belgium) to Marketharborough in England to Battersea, to Caherdaniel in Co. Kerry. My Grandmother was called Margareth Mary Theresa Cabus, born in Belgium. Her mother was English by the name of Elizabeth Frances Stanger, and wed my Belgian great-grandfather in her home town of Marketharborough during worldwar I when my Belgian great-grandfather was on leave from the Normandy war there. The story goes that they met in the local catholic church, where my great-grandmother played the organ. As it happened, my great-grandfather also played the organ, and the rest is history. I never met/knew my great-grandmother, but I do remember her daughter( my grandmother ) very well, and she loved music and remember she was an avid organ player. Little did I know the importance of playing the organ in my family! I plugged in all the info in the Familysearch website, and thanks to the English census documents of 1871 and 1861, I was able to puzzle a lot of information together, partially because someone else had provided references in the same family tree. At some point the surname of Sullivan comes to surface. Sullivan is one of the 3 most popular surnames in Ireland, so getting the right Sullivan branch is not easy. The last record that I found via Familysearch suggest that Dennis Sullivan marries Ellen Sullivan around 1841. Their daughter being Margarita Sullivan, my great-grandmother’s mother. Click here to go to the church records. Oh boy, 187 records… there are so many Dennis Sullivan’s.. However, you can filter further, based on event, by area or by time period. I filtered by marriages, and added an additional name( in fact I just did a search on the page for Ellen) and I got 6 results .. I am getting closer! There was one record where the bride was called Ellen, and her husband Dennis Sullivan. I am not entirely certain that Dennis Sullivan and Ellen Callahan ARE the parents of Margarita Sullivan, but based on the records from the English census I think they are. If you happen to be related to me, and can help me to document this, I’d love to hear from you! You can email me here! To finish, my research is far from complete! I’ll keep you posted on the Belgian research! There are a couple of genealogy primers I’d recommend you have a look at, they are very informative, and help you decide on how you wish to work, and things to keep in mind and also setting some expectations on how far you are likely to get into your research.